"A Knights Tale", the adrenalin & testosterone laden film with charges of oestrogen was released in August 2001. It faithfully portrays life in the jousting circuits of France in the period following the battle of Crecy  when the English army of Edward III and his son, Edward "The Black Prince" over-ran France. This period climaxed in a great victory by the "Black Prince" at Potiers in 1356. Although the characters of the film are somewhat embellished or encumbered with modernisms, they carefully include or mention contemporaries of the time such as Geoffrey Chaucer, Edward "The Black Prince", "John" Beaumont & the Earl of Warwick. There was a John de Bellomonte of Whitley Beaumont, Yorkshire whose father, Robert de Beaumont, is regaled in the ballad, 'The Eland Feud' whererin it is said that Robert was beheaded by John de Eland, sheriff of Yorkshire. There was also a Thomas Beaumont of Bolton Percy, Yorkshire, son of Henry de Beaumont, who was present at the Battle of Crecy 1346 'where he served in the King's division and provided one knight, seven esquires, five archers on horse and two on foot. He seems to have been knighted about this time. '1 He was afterwards present at the siege of Calais in 1347 and in 1355 was taken prisoner in action at Grand Serre in Dauphiny. There was also another soldier at the siege of Calais by the name of Thomas Beaumont. The Black Prince became one of the most feared warriors in Europe following the victory at Potiers in 1356. Sir Thomas' son, Adam Beaumont was probably killed in action whilst serving under the Black Prince in Spain in 1367. It was here that the prince contracted a severe lung infection from which he gradually died by 1376, predeceasing his father King Edward the III by one year. Chaucer who did pen the "Knightes Tale" was actually captured in France and as was common at the time, held to ransom. 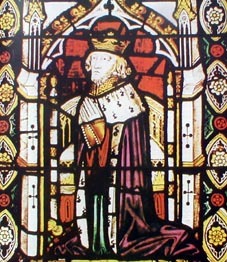 King Edward III was forced to pay the ransom along with others to safeguard Chaucer's return. 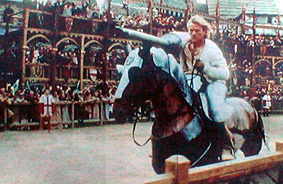 Chaucer did write a poem to "The Duchess" [Blanche Duchess of Lancaster], which the film character briefly presses upon the nobility during a moment of self promotion. There is no evidence that Chaucer was a gambler as portrayed in the film, nor a forger of documents, however for the plot these false embellishments do not fit uncomfortably. The armour, weaponry, costumes, workshops, ecclesiastical scenery, nuances - as with the "two-fingered salute", the repartee between the English and French and of course the jousting scenes, are much as it could have been. This is a refreshing almost bawdy taste of non-Hollywoodian proportions, thus lacking the predictable formulaic format of its American counterparts. This richer culture results from the globalisation of the film industry, breaking the mould of actors' stereotypes which have become tiringly predictable. The scenes shot in and around Prague, Czechoslovakia, where costs are lower and the weather is not so prone to rapid changes, evoke a European ambience rather than that of California. The scene of the hero's return to London, although done with computer imagery wonderfully reproduces some of the contemporary drawings of London Bridge built earlier in the reign of King John and which stood for 600 years. Here the bridge is graphically portrayed with its many smoky dwellings clinging to its huge structure. 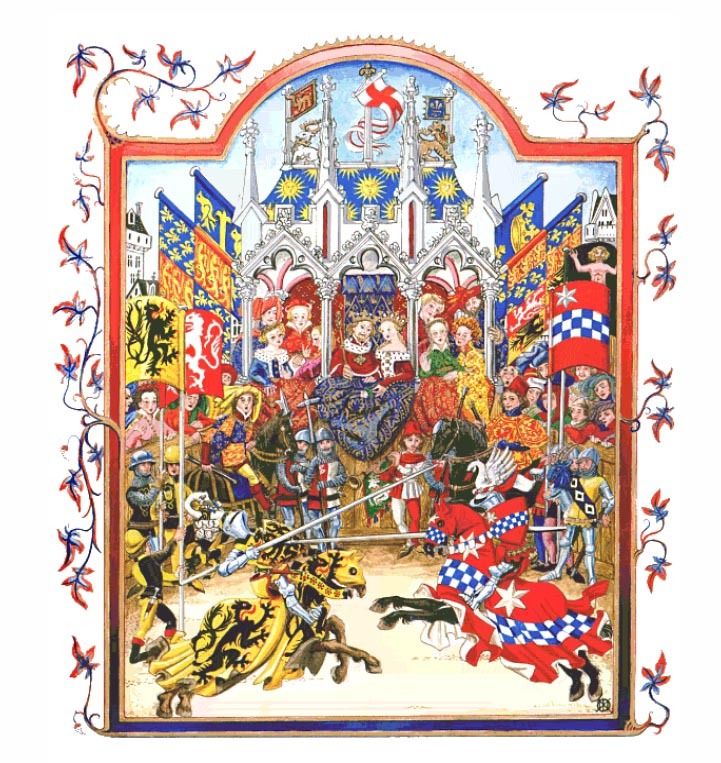 The tournament scenes with their 'corporate boxes' for the nobility, the shields charged with [probably fictitious] blazons and the stalls for the ribald peasantry is a fitting backdrop for the supposed eloquence of "Geoffrey Chaucer". The allusions to soccer crowd behaviour are a clever reflection of the medieval knight's supporters who have wagered their pay on the turn of a horse. This soliloquy vividly spotlights the feudal division in the class structure. We may wonder, have the modern corporations usurped the position of the nobles, down to their logos, trade marks and fictitious coats of arms, crests and achievements? The suit of armour with the blazoned shield now becomes a business suit with a blazoned tie. From the inverted blacksmith's trade mark, a not so subtle hint of global control over the new feudal society, with Western Christendom replaced by mass consumerism to the references by our modern leaders to a "Crusade." Does the past tell us anything of the future? A re-viewing of the film, now on DVD will no doubt shed light upon more parallels of fiction and truth which no doubt the author of the script, Brian Helgeland, has researched. How did the nobles become noble? This comment in the film has echoes of Quo Warranto ["I Hold"] in real history. A Knight's Tale - a film which portrays life in the jousting tournaments of France in the 1300's. If the film does nothing more than entertain it is worthy, if it encourages an interest in our Western European history, culture and genealogy, then it reigns. Your men love you. If I knew nothing else about you, that would be enough. But you also tilt when you should withdraw. And that is knightly too. "Three days after the arrival of the King of Portugal, came Sir Reginald de Roye, handsomely accompanied by knights and squires, to the amount of six score horse. They were all properly lodged, for the Duke had given his officers strict orders they should be well taken care of. On the morrow. Sir John Holland and Sir Reginald de Roye armed themselves, and rode into a spacious close, well sanded, where the tilts were to be performed. Scaffolds were erected for the ladies, the King, the Duke, and the many English lords who had come to witness the combat, for none had stayed at home. The two knights, who were to perform this deed of arms, entered the lists so well armed and equipped that nothing was wanting. Their spears, battle-axes and swords, were brought them and each being mounted on the best of horses, placed himself about a bow-shot distant from the other, but at times they pranced about on their horses most gallantly, for they knew every eye to be upon them. All being now arranged for their combat, which was to include everything except pushing it to extremity, though no one could foresee what mischief might happen, nor how it would end ; for they were to tilt with pointed lances, then with swords, which were so sharp that scarcely a helmet could resist their strokes ; and these were to be succeeded by battle-axes and daggers, each so well tempered that nothing could withstand them. Now, consider the perils those run who engage in such combats to exalt their honour, for one unlucky stroke puts an end to the business. Having braced their targets and examined each other through the visors of their helmets, they spurred on their horses spear in hand. Though they allowed their horses to gallop as they pleased, they advanced on as straight a line as if it had been drawn with a cord, and hit each other on the visors with such force that Sir Reginald's lance v/as shivered into four pieces, which flew to a greater height than they could have been thrown. All present allowed this to be gallantly done. Sir John Holland struck Sir Reginald likewise on the visor, but not with the same success, and I will tell you why. Sir Reginald had but lightly laced on his helmet, so that it was held by one thong only, which broke at the blow, and the helmet flew over his head, leaving Sir Reginald bare-headed. Each passed the other, and Sir John Holland bore his lance without halting. The spectators cried out that it was a fine course. The knights returned to their stations, when Sir Reginald's helmet was fitted on again and another lance given to him ; Sir John grasped his own, which was not broken. When ready, they set off full gallop, for they had excellent horses under them which they well knew how to manage, and again struck each other on the helmets, so that sparks of fire came from them, but chiefly from Sir John Holland's. He received a very severe blow, for this time the lance did not break ; neither did Sir John's, which hit the visor of his adversary without much effect, passing through, and leaving it on the crupper of the horse, and Sir Reginald was once more bare-headed. "Ha !" cried the English to the French," he does not fight fair : why is not his helmet as well buckled on as Sir John Holland's ? We say he is playing tricks, tell him to put himself on an equal footing with his adversary." "Hold your tongues !" said the Duke," and let them alone in arms, every one takes what advantage he can if Sir John think there is any advantage in thus fastening on the helmet, he may do the same. But for my part, were I in their situations, I would lace my helmet as tight as possible ; and, if one hundred were asked their opinions, there would be four-score of my way of thinking." The English, on this, were silent, and never again interfered. The ladies declared they had nobly jousted ; and they were much praised by the King of Portugal, who said to Sir John Fernando, " In our country, they do not tilt so well, nor so gallantly : what say you, Sir John ?" "By my faith, sir," replied he, "they do tilt well ; and formerly I saw as good jousts before your brother, when we were at Elvas to oppose the King of Castile, between this Frenchman and Sir William Windsor but I never heard that his helmet was tighter laced then than it is now. The King on this turned from Sir John to observe the knights, who were about to begin their third course. Sir John and Sir Reginald eyed each other, to see if any advantage were to be gained, for their horses were so excellent that they could manage them as they pleased, and, sticking spurs into them, hit their helmets so sharply that they struck fire, and the shafts of their lances were broken. Sir Reginald was again unhelmed, for he could never avoid this happening, and they passed each other without falling. All now declared they had well jousted ; though the English, excepting the Duke of Lancaster, blamed greatly Sir Reginald; but he said, "he considered that man as wise who in combat knows how to seize his vantage. "Know," added he, addressing himself to Sir Thomas Percy and Sir Thomas Moreaux, "that Sir Reginald de Roye is not now to be taught how to tilt : he is better skilled than Sir John Holland, though he has borne himself well." It was at this tournament that John of Gaunt [Duke of Lancaster] with his wife Constanza of Castile and King John I of Portugal were present. The king of Portugal later married one of Gaunt's daughters by Blanche, Philippa, whilst Sir John Holland was married to another of Gaunt's daughters, Elizabeth who was also present. These two daughters were sisters to Henry of Bolingbroke, later King Henry IV of England. Sir William Clifton, Sir William Clynton, and other gentlemen whom Froissart names, and many other knights and squires, that this was a challenge to England, and that they should take part in this sport; for, said they, ' Surely the knights of France have done well, and like good companions and we shall not fail them at their business.' So the Earl of Huntingdon, with over sixty knights and squires, passed the sea and lodged at Calais. In the second course they met without damage to either side, and in the third their horses swerved, and they failed to meet. ' The Earl of Huntingdon, who had great desire to joust and was somewhat chafed, came to his place and awaited Boucicault, but Boucicault would not take his spear, and showed that he would run no more that day against the Earl.' Then Huntingdon sent his squire to touch the shield of St. Pye, who came out of his pavilion, and ' when the Earl saw that he was ready, he spurred his horse, and St. Pye likewise ; they couched their spears, but at the meeting their horses crossed, and the Earl was unhelmed. Then he returned to his squires and ' was rehelmed and took again his spear,' and St. Pye his, and then they ran again and ' met each other with their spears in the midst of their shields ' so that each of them was nearly carried out of the saddle, but by the grip of their legs saved themselves, and so returned and took breath. ' Sir John Holland, who had great desire to do honourably, took again his spear and spurred his horse, and when the Lord of St. Pye saw him coming, hedashed forth his horse to encounter him ; each struck the other on the helmet so that the fire flashed out, in which the Lord of St. Pye was unhelmed, and so they passed forth and came to their own places. This course was greatly praised ; and both French and English said that those three lords, the Earl of Huntingdon, Sir Boucicault, and the Lord of St. Pye, had done well their devoirs, without any damage to each other. Again the Earl desired, for love of his lady, to have another course, but he was refused ; then he went out of the rank to give place to others, for he had run all of his six courses well and valiantly, so that he had laud and honour of all parties.' Huntingdon had not, however, touched the shield of Reginald de Roye, perhaps he was dissatisfied with that device of an unlaced helmet which he had experienced in Spain, or perhaps, having tested de Roye's strength before, he did not care, so near to Dover, to risk his dignity as brother to the King. But if he had been allowed his request for one extra course he would, perhaps, have run it against de Roye. In the rest of that day, however, and on the three following days, Sir Reginald met several English knights and had decidedly the better of most of them, for, says Froissart, 'he was one of the best jousters in the realm of France ; also he lived in amours with a young lady which availed him in all his business,'by increasing his spirit and daring, as such amours ever do. Thus it would appear that Sir John Holland modelled for Chaucer's knight in his Knightes Tale. 1. Beaumont, W.E. The Beaumonts in History A.D. 850 - 1850. ca. 1929, pp.86-94. This source does not contain many citations and might therefore be considered somewhat dubious. © Text Copyright Tim Midgley revised, 27th July 2014.